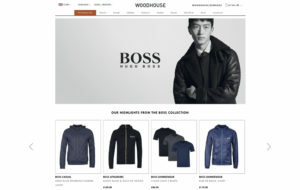 Thanks to Nosto, Woodhouse, which sells fashion from over 50 leading brands including BOSS, Armani and McQ , is able to automatically display real-time personalised product recommendations and onsite pop-up messages based on visitors’ onsite browsing behaviour. It is also now able to deliver personalised email campaigns using Nosto’s platform. For example by analysing data it collects about which items are commonly bought or browsed together, Nosto’s platform helps Woodhouse to enhance the shopping experience on product pages – by automatically displaying the most relevant cross-selling recommendations. Individual visitors are recognised and presented with recommendations personalised to their brand, style and product preferences, while those who are completely new to the site are presented with recommendations based on real-time bestsellers. 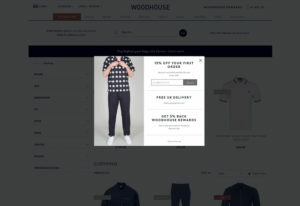 Woodhouse is also using Nosto to personalise its email campaigns to increase sales and customer loyalty. For example shoppers with abandoned shopping carts or browsing sessions are automatically retargeted with emails showing them products they had left in their cart or shown an interest in before leaving the site. This has helped to trigger an increase in email click through and conversion rate. 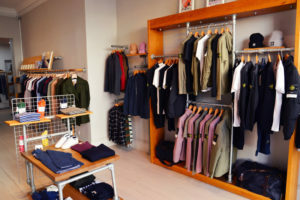 Nosto’s personalisation engine uses the power of big data to build a deep understanding of an online retailer’s store and every visitor interacting with it, allowing it to use machine learning to predict and automatically deliver the most relevant content to those visitors. It helps to maximise eCommerce conversions, average order value and customer retention.